Lover's Key, FL - Angie and Steve sneak away to the "other" west coast for the first getaway of the year. Mission Viejo, CA - Sean and Lisa's new addition to the Repetti Family!!! 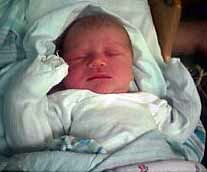 Ava Christine - 6lbs 12ozs - 18 inches long! Bowling Green, KY - Lisa and Clyde celebrate their 25th Wedding Anniversary with a big Hawaiian Luau - What a spectacular celebration it was...check out the Wedding Page for pics of the event. 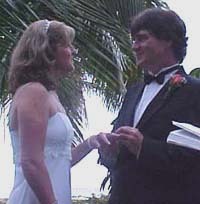 Per Amy's suggestion, latest additions to the web-site include a new Wedding montage on the wedding page as well as the addition of a really cute pic of Master Jackson Hill Crowe to the family page. Vista, CA - Mike and Carolyn's new addition to the Repetti Family!!! Ashley Elizabeth Repetti - 9lbs 2ozs - 21 inches long! Bowling Green, KY - Jay and Rita's new home...they are lovin' it big time! Plantation, FL - Fun, fun, fun...Ang has been playing "web-master"!!! Check out new stuff on the wedding page - Ashley and Adam - and check out the family page - click on Amy Wetzler to see a new montage of pics! More to come real soon so keep checking back and PLEASE sign the guest book! Bowling Green, KY - Click here for breaking news, Freshman, Kristen Smith, who placed 11th overall out of 58 cross-country runners and placed 1st for her high school in the race. Go Kristen!!! Russellville, KY - Ok, it's official, the master of Bookworm lives in Kentucky! That is unless you can top a score of 6,310,000 -- posted to the official Bookworm site too!!! You go, Momma!!!! Thompson Station, TN - per Grammy Karen, Ms. Hali Smith scored a “header point” last Saturday in a playoff game – Awesome Hali! Got some breaking "Angie and Steve" family news? Click here to tell us about it. 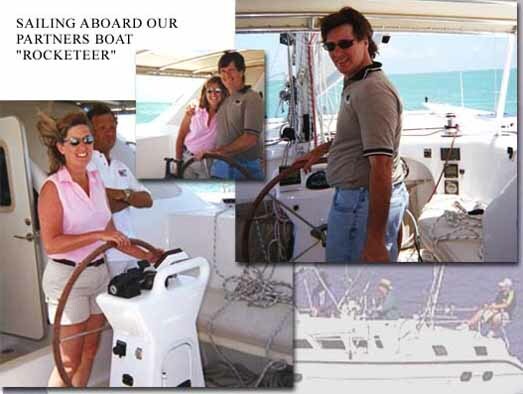 The "Rocketeer" is a 60'+ catamaran that sails the Caribbean waiting for the right time and place to hook up...and then all is perfect...crystal blue water...Bob Marley and Jimmy Buffet...warm breezes...cool drinks..."Oh Cabin boy!" Latest pics of GrandKid's, Dallan and Jeremy - A handsome couple of boys! Momma's newest family member, courtesy of Angie, Steve, Lisa, Clyde, Jay, Rita, Rusty, and Melissa -- Christmas 2005. "The Pomeranian dog is the smallest member of the Spitz dog family. The Pomeranian dog is descended from ancient sled dogs of the far northern European countries. It got its name from that region on the Baltic sea, but only after it arrived in England. 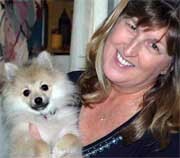 The miniature toy Pomeranian dog is a true Spitz breed..."
April 2006, Hawaii - Lisa and Clyde celebrate their 25th anniversary in Hawaii via Nashville, Houston, Seattle, Hawaii, Los Angeles, Houston, and Nashville. April 30, 2009 - Happy Fifth Birthday to Cosmo! Two years old in human terms, 14 in dog years!